History Undressed: Take Magnus With You Contest! I wanted to let you all know about a fun contest I'm hosting right now called, Take Magnus With You. Magnus is the hero in my latest novel, The Highlander's Reward (available now in both ebook and print). 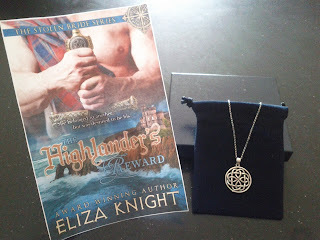 Winner of the contest receives a gorgeous sterling silver Celtic knot necklace. Check out my website for the fun details and many ways to win!!! !